Jim Breaks was born on the 25th March 1940 in Bradford and as a teenager entered the amateur wrestling ranks where he won the Northern Featherweight Championship but this was just the start as Jim would go on to become one of the greatest lightweight wrestlers in the history of the business. On the back of his amateur wrestling experience, Jim was trained for the professional ring by Bernard Murray, himself a very talented wrestler. Jim was a long way of championship glory but made his professional debut at Eltham in 1958 where he actually wrestled Bernard Murray. As one might expect, on this occasion it was a case of teacher beating student but Jim was not to be deterred and it only made him more adamant to succeed at the highest level in the profession. On the 16th October 1963 in London Jim was given what he had been working his entire career for, a title match for the British Lightweight championship against Melwyn Rees. A determined Jim trained hard and it paid off as for the first time Jim won the title and was declared champion. Jim held the title until the 15th February 1967 when he lost it to Al Miquet. However, this was far to be Jims last taste of glory and he went on to win the belt a further 9 times losing it for the final time against Steve Grey on the 22nd March 1984. With televised wrestling now reaching record audiences Jim Breaks soon became a regular and and his rule bending and quick one liners to the fans at ringside only provoked an even louder chorus of boos whenever he appeared. 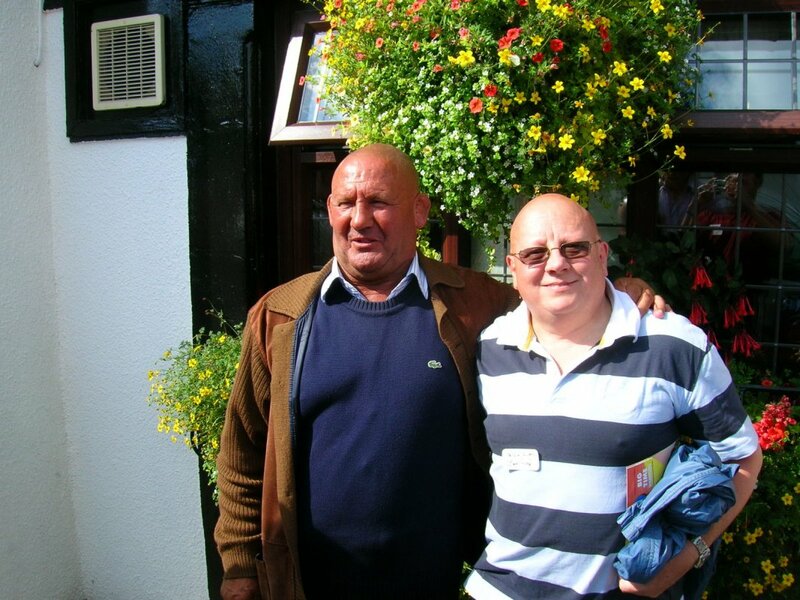 It is believed that Jim actually appeared on itv wrestling for a period of 28 years, this being longer than any other wrestler and with the exception of the late Mick McManus appeared more times than anyone else. Jim Breaks was a very versatile and technical wrestler, his speciality was a painful double arm submission hold which was soon known to the millions of fans as the Breaks Special. Jim used this hold in the majority of his matches and very few wrestlers could counter it usually meaning that Jim would pick up the victory. Whilst Jim was known as one of the best in the business, he was also known for his temper tantrums when things did not go quite his way in the ring, he was very often seen to jump up and down on the spot which in time earnt him the nickname of 'Crybaby Breaks' and before long fans would bring babies dummies and throw them into the ring as Jim entered. It was all light hearted fun and showed just in reality what a sportsman and entertainer Jim was. Breaks, whilst being a lightweight wrestler, would often proceed through the ranks and in the main was very successful. On the 6th November 1967 he defeated Alan Sargeant for the British Welterweight title and although he would go on to lose the title back to Sargeant shortly afterwards Jim would go on to capture this title a further 7 times before losing it to Danny Collins on the 21st March 1984. By this time Jim was well established in the wrestling business and although he was not a wrestler to go on vast World tours his championship reigns were not just limited to Britain. On the 9th March 1967 he defeated Modesto Aledo for the European Lightweight title in a match held in Breaks home town of Bradford. As with all of Breaks title wins he would eventually go on to lose the title but he regained it a record 13 times tasting victory for the final time in 1988. It is without doubt that Jims biggest triumph in the ring was when he was victorious for the World Lightweight Championship. 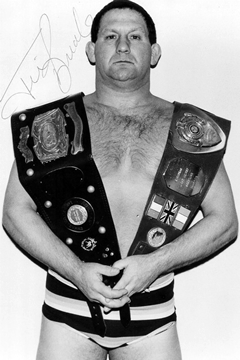 When Jim had entered the business it would have been a distant hope of winning this title as at the time (and until the mid 1970s) it was held by what many consider to be the greatest lightweight wrestler in history George Kidd. However, Kidds retirement opened the opportunity for others such as Jim, Johnny Saint and Steve Grey to challenge for the belt. 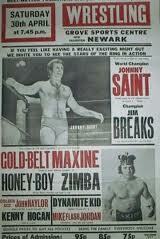 Johnny Saint had held the title for a number of years but Jim was ready and at a thrilling match in Croydon Jim was successful in his endeavours and won the title. Although he was to lose it back to Saint shortly afterwards Jim was triumphant on a further occasion making himself a two time World champion. Jim and Johnny Saint had a rivalry matched by very few others throughout their careers although both men had respect for the other which showed in their titanic battles in the ring. As Jims career was starting to wind down he still had time for the young up and coming wrestlers. Jim wrestled them all from the Dynamite Kid, Young David, Danny Boy Collins to name but a few and whilst they sometimes got the upper hand over the master he would normally show them who was boss on the return contest. It is without doubt that Jim Breaks is one of the biggest names in British Wrestling history, a career spanning in excess of 30 years and more championships that probably any other wrestler in the UK makes him an obvious choice to be inducted into the Hall of Fame. Jim is now retired from the ring although he has attended the Reunion where he gets to meet his fellow professionals and shares a joke with the fans.